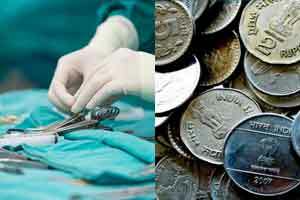 Nashik: A 50-year-old tribal from Maharashtra’s Palghar district has been successfully operated upon on Thursday by doctors to remove 72 coins that the man had swallowed over a long period due to certain mental illnesses, doctors said. Dr Amit Kele, who led the team of doctors that operated on Krishna Somalya Sambar, said Sambar was suffering from a rare case of metallophagia, an impulse to swallow metallic objects. Sambar is a resident of Thoratpada in Talasari taluka of Palghar, he said. “He is suffering from ‘bezoar’- a gastrointestinal disorder- and ‘pica’- a compulsive disorder of eating non-nutritional substances- for the past 20 years. This made him a habitual eater of iron and metal coins. Some got flushed out of his system in the natural course of excretion but others remained,” said Kele on Saturday. The doctor added that this was causing Sambar problems like vomiting and indigestion. Sambar approached the medical team on Thursday and following an X-ray, the doctors proceeded to operate upon him. The doctor added that the endoscopic surgery lasted for three and a half hours and that Sambar’s condition was improving. He would soon be discharged from the hospital, Kele added.